Hi folks! I have a really nice Nashville made ’59 ES-335 reissue in the shop today for a new nut. 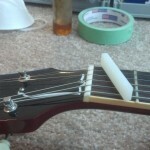 The old nut is made of Corian material and is worn to the point of buzzing against the 1st fret on a couple of strings. 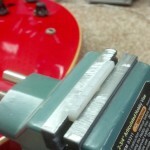 The customer wants to replace it with a more vintage correct 6/6 nylon nut like what was used on original ’59 ES-335′s. I am going to make a new nut using our Mojotone 6/6 nylon nut blank. 6/6 nylon material is extremely durable with less friction and excellent tuning stability as compared to bone or Corian. I don’t recall ever seeing an original nylon nut wear out over time. Usually I only need to replace them if the slots have been cut too low. First I score the lacquer around both sides of the nut with an exacto blade to prevent chipping the lacquer when I remove the old nut. 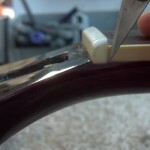 I always angle the blade in towards the nut so the lacquer won’t lift or chip on the neck itself. I’m not worried about chipping the lacquer on the nut considering I am throwing it away. 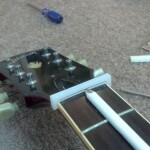 Next I remove the truss rod cover and score the back edge of the nut while slightly angling the blade in towards the nut. Most shops will use a thin saw blade to cut the nut away from the veneer which also removes some material and I don’t like that. I prefer to use a razor blade and cut down between the nut and headstock veneer by carefully cutting several shallow passes until I am through the veneer. It’s more time consuming and also risky if you don’t know what you are doing, but I find it to be less intrusive and it doesn’t create a gap between the back of the nut and veneer like a saw does. Now I can very carefully remove the nut. I do this by feel and of course lots of experience. 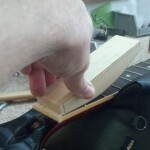 Using a curved wooden block I made, I knock the front edge of the nut towards the headstock with my fret hammer. This nut loosened fairly easy with the first blow. Then I was able to knock it out side ways the rest of the way. 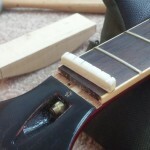 If I can’t knock it loose with a reasonable amount force, I would choose to heat the nut and loosen the glue joint. You never want to smack the tar out of it and risk damaging the guitar. Fortunately I didn’t have to use heat on this one. 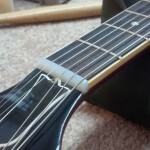 You just have to handle each guitar differently and proceed with extreme caution. 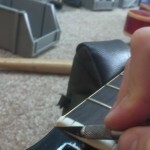 After I thickness the nylon nut blank to fit snug in the channel, I use a 1/2 pencil to mark the top of the nut by moving the pencil across the frets and marking the nut. This gives me a ballpark of where the top of the nut should be and how much material I need to remove. The new nut blank is oversized and needs to be shaped to fit this guitar. I use a mechanical pencil to trace the sides of the nut so I can sand the ends down to the pencil lines. I use my belt sander to remove the material down to the pencil lines. I have to be careful because the nylon can melt as I sand it so I take my time. Then I rough in the nut slots using the old nut as a reference to getting my E to E spacing correct. Once I am close with everything I can move to final shaping and fitting the nut by hand. 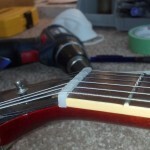 Now I can remove material from the top of the nut so the slots are not too deep and the strings can move freely through the slots. I also round the edges and final sand the nut until all scratches are gone. Then I buff it to a glossy and finished look. Time to glue the nut into place. 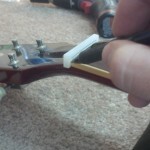 Since the nut fits so snug into the channel, I don’t need a strong glue to hold it into place. And I need some time to position it correctly without the glue setting too fast. I also want to make it easy for removal down the road so I use a small amount of wood glue to hold it into place. The final adjustments and setup are done. 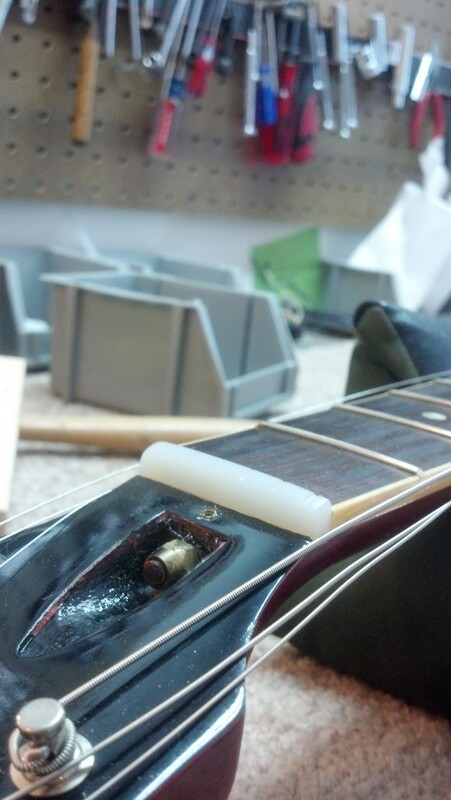 I used a small amount of GraphitALL nut slot lube to make the slots as slick as possible for the strings. Now this guitar looks closer to an original ’59 than before. 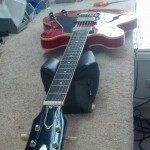 If only I can talk him into replacing these Gibson pickups with some of our PAF Clones. Then it would sound amazing! For now I’ll move on to the next guitar. Thanks! This entry was posted in Technical by david. Bookmark the permalink.